The James Garfield Presidential Dollar was released into circulation on November 17, 2011. This marked the 20th release of the series honoring the former Presidents, and wrapped up the fifth year of the series. Prior to being elected president, James A. Garfield was elected to the Ohio state senate and elected to the U.S. Congress, where he would serve for 18 years. He would only serve as the President of the United States for a brief 200 days, the second shortest tenure after William Henry Harrison. Just four months into his term, he was shot while entering a railroad station in Washington, D.C. One of the bullets would remain lodged near his spine and cause him to become increasingly ill until he eventually died 80 days later. The obverse of the James Garfield Dollar featured the former President’s portrait with inscriptions indicating his name, the motto “In God We Trust”, the order of the Presidency, and the year during which he served. The reverse carried the design common to all issues of the series depicting the Statue of Liberty with inscriptions “United States of America” and “$1″. The edge of the coin included the date, mint mark, and motto “E Pluribus Unum”. The designer and sculptor of the obverse was Phebe Hemphill, while the reverse was designed and sculpted by Don Everhart. 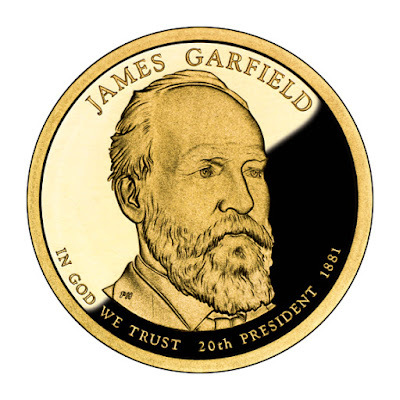 An official launch ceremony for the James Garfield Presidential Dollar was held on the circulation launch date at the James A. Garfield National Historic Site, located at the 20th President’s family home. 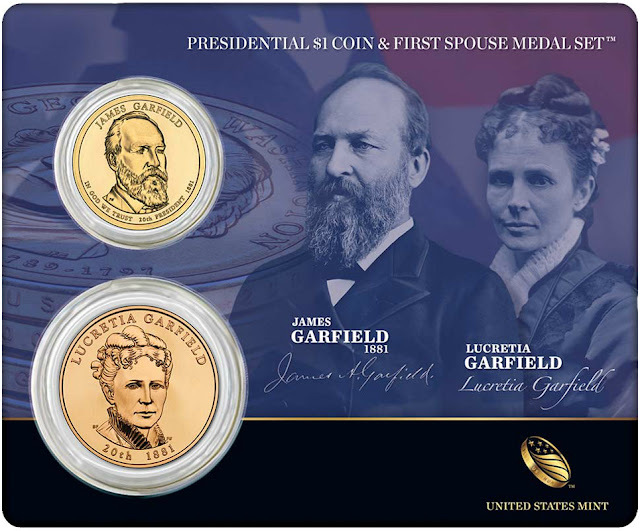 The ceremony was attended by United States Mint Acting Associate for Manufacturing Marc Landry, Rudolph Garfield, a great-grandson of President Garfield, and Dr. Allan Peskin, professor emeritus of history at the Cleveland State University and author of “Garfield,” the definitive biography of James Garfield. Although it was not known at the time, this would be the last official launch ceremony held for the program. The total mintage for circulation reached 74,200,000 pieces across the Philadelphia and Denver Mint facilities. Notably, this would be the final issue of the series produced for release into general circulation. The subsequent issues of the series would only be issued within numismatic products offered by the United States Mint at a premium to face value. On October 28, 1886, President Grover Cleveland accepted the Statue of Liberty on behalf of the United States and said, in part, "We will not forget that Liberty has here made her home; nor shall her chosen altar be neglected." She is the work of sculptor Frederic Auguste Bartholdi, who enlisted the assistance of engineer Alexandre Gustave Eiffel, designer of the Eiffel Tower, to help him solve some of the structural challenges presented by creating a statue of such magnitude. The Statue of Liberty was completed in 1884 and shipped to the United States in June 1885, having been disassembled into 350 individual pieces that were packed in over 200 crates for the transatlantic voyage. In four months’ time, she was re-assembled in New York Harbor, standing just over 151 feet from the top of the statue’s base to the tip of the torch her right hand holds high above the waters of New York Harbor. Originally intended as a gift to celebrate the American Centennial in 1876, the Statue of Liberty was given to the United States as a symbol of the friendship forged between the new American government and the government of France during the American Revolutionary War. The tablet she holds in her left hand carries the inscription "July IV MDCCLXXVI" in reference to the July 4, 1776, signing of the Declaration of Independence and the birth of the Nation. There are 25 windows running the length of Lady Liberty’s crown, which is topped by seven rays, meant to convey both the light of the sun and the seven seas and continents of the world. For millions of Americans, the Statue of Liberty was the first sight that their ancestors saw as they arrived in America after having left their homes in search of a better life for themselves and for their families. To celebrate her 100th anniversary, the Statue of Liberty was featured on a United States commemorative coin in 1986. In 1997, a close-up image of the Lady Liberty was chosen for the obverse of the new American Eagle platinum coins. Presidential Dollar Coins feature larger, more dramatic artwork, as well as edge-incused inscriptions meant to revitalize the design of United States coins and return circulating coinage to its position as an object of aesthetic beauty. The U.S. Mint launched the Presidential $1 Coin Program in 2007. The 10-year initiative includes one dollar coins featuring obverse designs honoring the Presidents in the order in which they served in office. 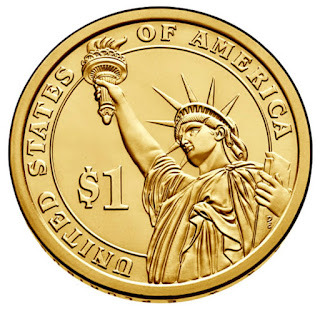 The U.S. Mint produces and issues four Presidential Dollar coins per year, each with a common reverse design featuring a striking rendition of the Statue of Liberty. 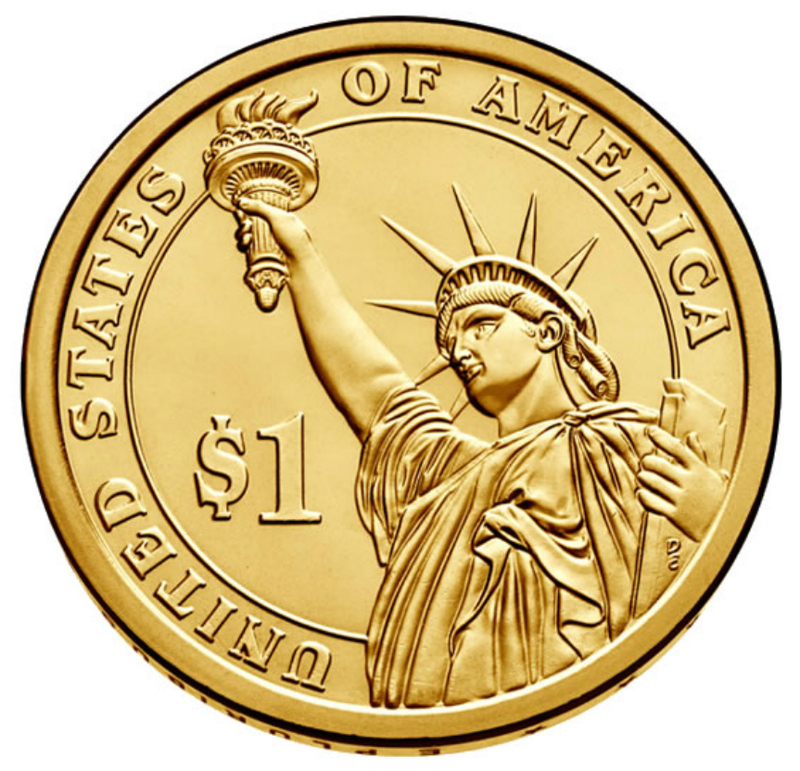 The program was authorized by the Presidential $1 Dollar Coin Act of 2005 (Public Law 109-145). James Abram Garfield (November 19, 1831 – September 19, 1881) was the 20th President of the United States, serving from March 4, 1881, until his assassination later that year. Garfield had served nine terms in the House of Representatives, and had been elected to the Senate before his candidacy for the White House, though he declined the senatorship once he was president-elect. He is the only sitting House member to be elected president. Garfield was raised in humble circumstances on an Ohio farm by his widowed mother. He worked at various jobs, including on a canal boat, in his youth. Beginning at age 17, he attended several Ohio schools, then studied at Williams College in Williamstown, Massachusetts, from which he graduated in 1856. A year later, Garfield entered politics as a Republican. He married Lucretia Rudolph in 1858, and served as a member of the Ohio State Senate (1859–1861). Garfield opposed Confederate secession, served as a major general in the Union Army during the American Civil War, and fought in the battles of Middle Creek, Shiloh, and Chickamauga. He was first elected to Congress in 1862 to represent Ohio's 19th District. Throughout Garfield's extended congressional service after the Civil War, he firmly supported the gold standard and gained a reputation as a skilled orator. Garfield initially agreed with Radical Republican views regarding Reconstruction, but later favored a moderate approach for civil rights enforcement for freedmen. At the 1880 Republican National Convention, Senator-elect Garfield attended as campaign manager for Secretary of the Treasury John Sherman, and gave the presidential nomination speech for him. When neither Sherman nor his rivals – Ulysses S. Grant and James G. Blaine – could get enough votes to secure the nomination, delegates chose Garfield as a compromise on the 36th ballot. In the 1880 presidential election, Garfield conducted a low-key front porch campaign, and narrowly defeated Democrat Winfield Scott Hancock. Garfield's accomplishments as president included a resurgence of presidential authority against senatorial courtesy in executive appointments, energizing American naval power, and purging corruption in the Post Office, all during his extremely short time in office. Garfield made notable diplomatic and judiciary appointments, including a U.S. Supreme Court justice. He enhanced the powers of the presidency when he defied the powerful New York senator Roscoe Conkling by appointing William H. Robertson to the lucrative post of Collector of the Port of New York, starting a fracas that ended with Robertson's confirmation and Conkling's resignation from the Senate. Garfield advocated agricultural technology, an educated electorate, and civil rights for African-Americans. He also proposed substantial civil service reform, eventually passed by Congress in 1883 and signed into law by his successor, Chester A. Arthur, as the Pendleton Civil Service Reform Act. With his term cut short by his death after only 200 days, and much of it spent in ill health trying to recover from the attack, Garfield is little-remembered in the American cultural memory other than for his assassination; historians often forgo listing him in rankings of U.S. presidents due to the short length of his presidency. World Coins Dictionary of Numismatic Names C.